Heat oven to 350°F (325°F for dark or nonstick pan). Make and bake cake mix as directed on box for 13x9-inch pan. Cool 10 minutes. Run knife around sides of pan to loosen cake; remove from pan to cooling rack. Cool completely, about 1 hour. Place cake on tray. Frost top and sides of cake with frosting. 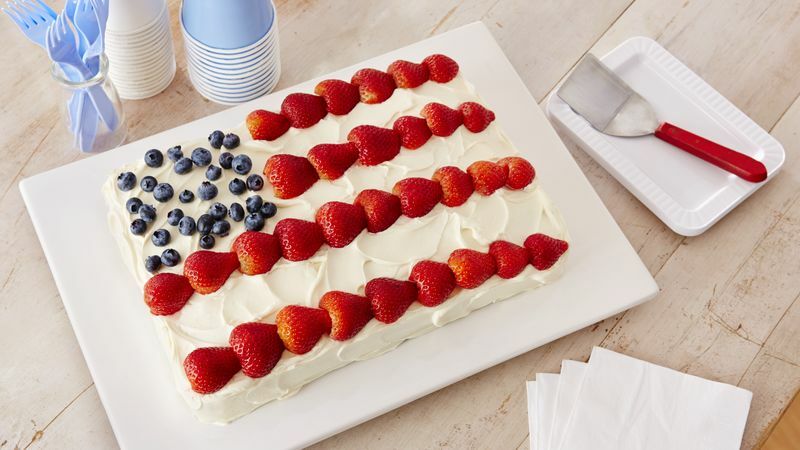 For flag design, arrange blueberries on upper left corner of frosted cake to create stars; arrange strawberries in rows over frosted cake to create stripes. Serve immediately. Store covered in refrigerator. Create an attractive display by covering a piece of sturdy cardboard with wrapping paper, then plastic food wrap. Stretch and secure with tape. Or cover cardboard with foil or cooking parchment paper.